From box CP/CENT/COMM/09. FILE 01: Papers of the committee, including minutes of meetings, submissions from members and comments thereon, especially by John Williamson, draft and final report of the Commission to the EC, 1964-1965. -- FILE 02: Submissions from party organisations and from individual members to the Committee for consideration, 1964-1965. CP/CENT/COMM/09/01: Papers of the committee, including minutes of meetings, submissions from members and comments thereon, especially by John Williamson, draft and final report of the Commission to the EC, 1964-1965. 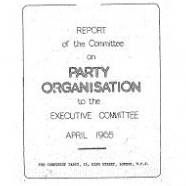 CP/CENT/COMM/09/02: Submissions from party organisations and from individual members to the Committee for consideration, 1964-1965.